History and heritage have unusual ways of preserving themselves. The ancient scriptures and monuments, which have stood archaeological excavations, cave paintings and much more, all have a fascinating story to narrate, which is revealed in the most incredible manner at the most unexpected place. 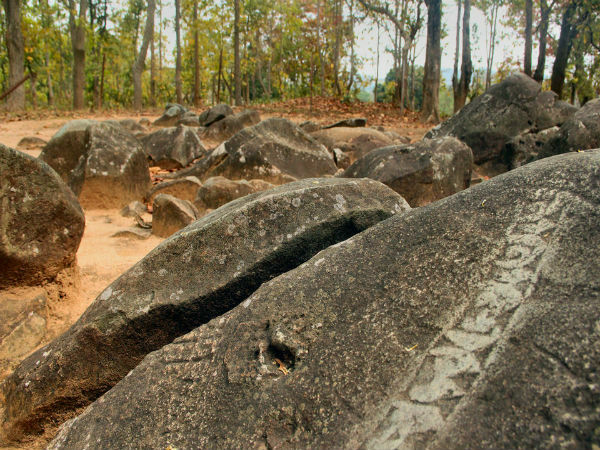 One such place is Sitabinji in Odisha, which has preserved a chapter of history, and is located amidst giant rock boulders, which have a striking resemblance to a small platoon of soldiers, who are protecting the ancient treasure chest. The place gets its name from a nearby stream, which is named as Sita. The tiny hamlet of Sitabinji has a population of less than 1000 but has volumes to narrate when it comes to history and myths. According to one such legend, it is said that Sita Devi used this place as her home when she was abandoned by her husband Rama. Locals believe that she gave birth to the twins, Lava and Kusha, at this place. One can find a small shrine, which houses the stone idols of Sita and her sons, which are located in-between a natural cavity formed by two treacherous, large boulders, which balance against one another in different angles. Another large boulder, which looks more mysterious amongst the two, is named as Bhandara Ghara, which in translation from Odia means storehouse. The place is said to be the hiding place of the stolen treasures of the dacoit Ratnakar, who later transformed into Valmiki and composed the Ramayana. According to historians, there are evidences which throws light upon few Buddhist monks who belonged to the Hinayana sect of Buddhism and had made Sitabinji their home during the 4th to the 6th century BC. The most well-known structure here is probably the rock of Ravana Chhaya which in translation means the Shadow of Ravana. Yet again, this place, too, has two huge boulders which are lounged against one another to create a triangular crevice which measures 6.7 m in height and 4.7 m in depth. It may seem as though the two boulders were deliberately placed in this unique manner to preserve the treasured artwork for the generations to come. The main rock is in the shape of a half-closed umbrella and is situated on the top of another boulder. It is said that the king of Lanka, Ravana, has a major contribution to this structure, as he was well known for his magical powers. Going back to the 7th century, the paintings at the rock shelter was made using the tempera technique. The rough granite surface was smoothened with the help of a thin layer of lime before applying the colours, which is synonymous to the tempera paintings. The paintings do not depict any religious symbols or characters but showcase a majestic figure sitting atop an elephant with a sword in hand along with a number of followers on foot, who are further accompanied by horsemen. One can find inscriptions here which date back to more than 1000 odd years. The site also has pieces of bricks from unidentified structures, which are brimming with inscriptions in Pali. There are also figurines made out of soapstone and coins which belong to the Kushanas, which all throw light upon the fact that Sitabinji must have been an active hub in those days. A few geologists have argued that these boulders are one of the oldest formations to be found on earth. Surrounded by the large imposing rock formations, one would be bound by the dwarfish feeling under these majestic monumental and massive structures in one place, which are seemingly arranged in symmetrical patterns by unseen hands.